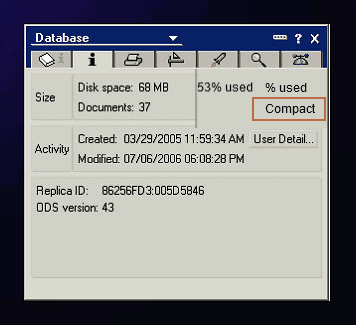 How to Manage Lotus Notes Database File Size Limit When It Exceeds? This message indicates that Lotus Notes will not record further transactions or create new database elements until user reduces the size of the database. However, it does not stops routing of mails, which means user can still send/receive messages and respond to them, but cannot save them. The ‘quota exceeding error’ is a result of poor database management. This situation can occur due to duplicate emails, addition of excessive design elements in the mail database or creation of drafts. Often users delete duplicate emails or unnecessary drafts to reduce the size of the database, but that doesn’t reduce the database size as the deleted mails still reside in the Trash. For concrete results, it is important to understand the proper management of Lotus Notes database file size quota. User can also change these settings after the creation of mail database through “Set Quotas” option under Database in Domino Administrator client. Step 1. Delete irrelevant emails Unnecessary emails consume a lot of space. So, remove them permanently and make some room for new mails. Step 2. Manage attachments Download all the attachments from the mailbox and save them on some safe location. Thereafter, permanently delete the associated emails (if they are not important) to make space for new mails. Step 3. Change automatic save settings for sent emails By default, sent emails get saved automatically to the mailbox. To reduce the database size disable this setting and remove sent items. Step 4. Archive rarely used documents and delete old Lotus Notes attributes There are documents which are rarely used but are important in some or the other way. So, create archive for such emails and remove them from the main database. Also, remove old calendar entries, to do lists, notes, appointments etc. and generate space for new elements. 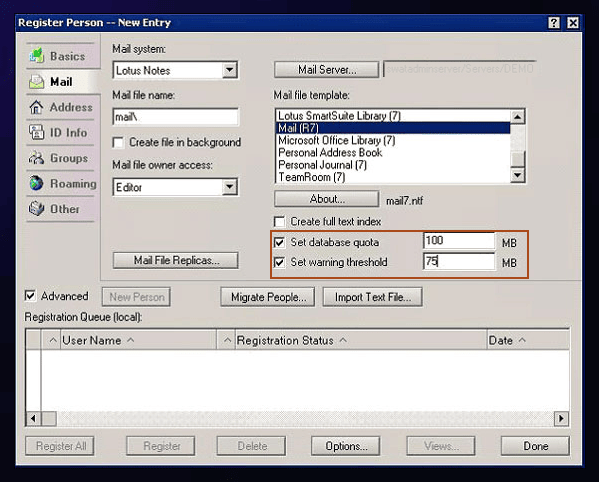 Instead of deleting Notes emails (so as to save space), organizations can think of saving them in PST format. Initially you can try some free NSF to PST conversion methods (like exporting NSF data to CSV and then importing to Outlook). But non-technical users may require a professional tool like Kernel for Lotus Notes to Outlook software to convert NSF file to PST. In addition, they can save NSF files to Exchange Server using this tool.